I have recently found 2 new loves: a vintage shell stitch, and Red Heart’s It’s a Wrap Rainbow yarn. 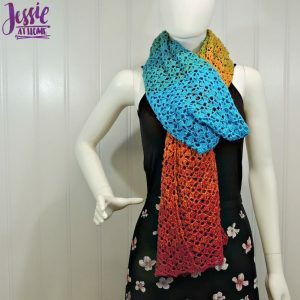 I mix the two together to come up with this fabulous rectangular wrap. It just makes me so happy. The wrap is nice and long so you can style it a multitude of ways. You could also make one half as long by just using one skein of yarn and stopping before the second is added on. Either way, you will be the height of style! This pattern is worked from the middle to one side, then the next cake of yarn is attached to the middle again and worked to the other side.